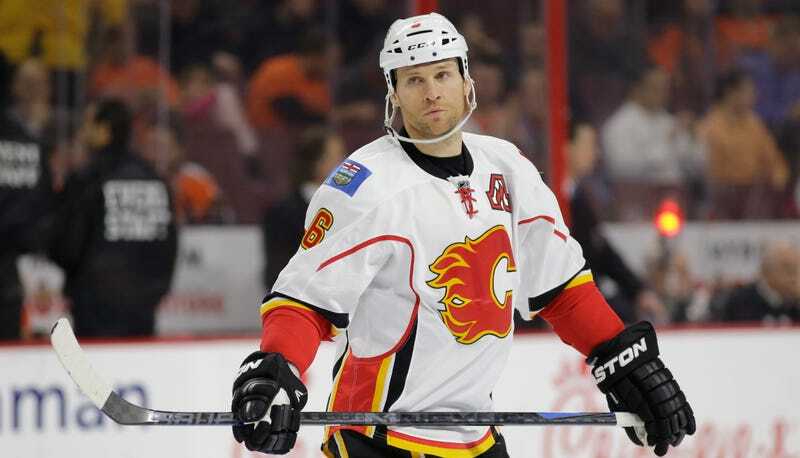 Calgary Flames defenseman Dennis Wideman was initially handed a 20-game suspension for checking linesman Don Henderson in a game on Jan. 27, a punishment upheld upon appeal by commissioner Gary Bettman. But Wideman appealed even further, to an independent arbitrator—a recourse first offered under the last CBA—and today that arbitrator reduced the ban to 10 games. Too bad Wideman’s served almost the entire initial suspension already. Sportsnet’s Nick Kypreos first reported the news, and Wideman is eligible to play tonight, which would’ve have been his 20th game. As for his last nine missed games, all this means is that he’ll collect back pay—the reduction will save him about $282,000 in game checks. In this case, no one’s going to complain too much. (The NHL will not force every team to replay the last two weeks’ worth of games.) But imagine if an actually good player on a team in the playoff hunt was forced to sit out nine games longer than his actual suspension turned out to be. This appeals process is untenable, and everyone seems to know it—both the NHL and NHLPA have made noises about revamping this process, because it can’t take 44 days between the incident and ultimate ruling, not if the player must serve his suspension even while his appeal is ongoing. This was the first test of the process enshrined under the 2013 CBA, and if it’s no consolation to Wideman or the Flames, it was always going to take a guinea pig for things to get fixed.